Car Depreciation Calculator | How Much Will My Car Be Worth? This Car Depreciation Calculator will calculate the annual, total, and lifetime depreciation costs of buying a new or used vehicle. You just might be shocked at how much these depreciation costs add up over the course of your lifetime -- not too mention how much of your potential future wealth will be forfeited in the process. If you would like to estimate all costs associated to buying and owning a vehicle (depreciation plus tax, license, finance charges, gasoline, insurance, maintenance, repairs, etc. 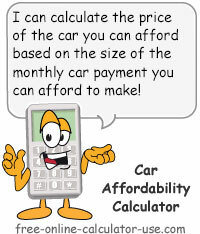 ), be sure to visit the Car Buying Calculator. Calculate vehicle depreciation in terms of what it will cost you, including foregone interest earnings. 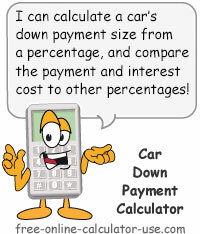 Enter the purchase price of the car you own or are looking at buying. Enter without any dollar signs or commas. The current age of the vehicle in number of years. If the car is new, enter a zero. Enter the number of years you plan to own the vehicle. Optional: Enter the average number of miles you expect to drive the vehicle each year. 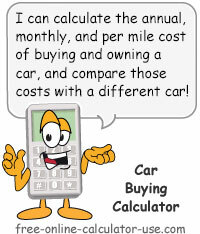 The calculator will use this entry to calculate the car depreciation cost per mile. Be sure to select a depreciation level (Low, Medium, High) that reflects the number miles per year. These depreciation levels can be selected in the expandable "DeprecDepreciationAccumulated depreciationAccumulated depreciation" form. Enter the number of years you expect to repeat the buy-sell/trade cycle. The Car Depreciation Calculator will use this figure to estimate your total depreciation and opportunity costs between now and when you no longer need a vehicle. Enter the annual percentage return you would expect to earn on your investments. Enter as a percentage but without the percent sign (for .06, enter 6). The Car Depreciation Calculator will use this figure to estimate your total opportunity cost between now and when you no longer need a vehicle. This is the accumulated depreciation rate based on the age of the car, the number of years you plan to own the car, and the annual cost of deprecation. Expand the description in this row to view and/or edit the year-by-year depreciation rates to suit your preference. The following chart contains the default year-to-year depreciation rates used by the Car Depreciation Calculator. Feel free to change the rates as you see fit. You can choose High, Medium, or Low (clicking a second time restores the defaults), or manually change each year's rate (enter as percentages, so for .28, enter 28). Note that the figure entered in Year 10 will be repeated for every year after if you will keep the vehicle past the point when the car turns ten years old. Based on your entries, this is how old the car will be once you are ready to sell, trade, or scrap the vehicle. Based on your entries, this is the total depreciation cost for the number of years you plan to own the vehicle. Based on your entries, this what the vehicle will be worth when you are ready to sell, trade, or scrap the vehicle. Based on your entries, this is the average annual depreciation percentage. The newer the vehicle you purchase and the more often you purchase newer vehicles, the higher will be the annual depreciation cost percentage. Based on your entries, this is the average annual depreciation cost (total cost divided by number of years owned). The newer the vehicle you purchase and the more often you purchase newer vehicles, the higher will be the annual depreciation cost. This is the average depreciation cost per mile, which is the average annual depreciation cost divided by the average number of miles you will drive the vehicle per year. If you left the "Miles per year" field blank, this line's result will be "n/a". Based on your entries, this will be your lifetime depreciation cost if you continue to purchase vehicles in a fashion similar to this vehicle (price, age, years of ownership). If you want to lower this cost you will need to either purchase newer vehicles less often or switch to purchasing older vehicles. Based on your entries, this is the estimated future value of your investments (opportunity cost) if you invested the average annual depreciation cost. Since most of us need a car, there is no way to completely eliminate this lost future value, so the goal should be to try to reduce it as much as possible. If you want to lower this cost you will need to either purchase newer vehicles less often or switch to purchasing older vehicles. Enter the current age of the car. If the car is new, enter a 0. Enter the number of years you plan to own the car. Optional: Enter the number miles you expect to drive the car each year. Enter the number of years to calculate lifetime depreciation costs for. Enter the annual percent return you would expect to earn on your investments. Adjust the year-to-year depreciation rates (if you don't agree with the default rates). 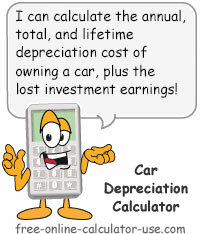 Click the "Calculate Car Depreciation" button. What depreciation is, three methods for calculating it, and steps for minimizing its cost. When you purchase a car you are actually trading one asset (cash) for another asset (automobile). At the time of the trade it's presumed that the value of the cash traded away is equal to the value of the automobile the cash was traded for. In other words, no expense should actually occur at the time of the trade (if only that were true in all cases). An expense occurs as the value of the automobile drops below the value of the cash that was traded for it. This drop in value is referred to as "Depreciation." Difference between the purchase price and the selling price (straight line). This method is based on the purchase price of the vehicle, its current age, and its estimated yearly depreciation rates. However, while the price and age of the vehicle are known values, its annual depreciation rates are speculative in nature and vary wildly between makes and models. Therefore all we can do is to estimate the depreciation rates based on an average of all reporting agencies (they also vary wildly). Based on my research, the general consensus seems to be that new cars depreciate an average of 24% in the first year and 15% in remaining years. For year #1, multiply the purchase price by the first year depreciation rate and subtract the result from the price. For all remaining years, multiply the previous year's reduced value by the current year's depreciation rate, and subtract the result from the previous year's value. 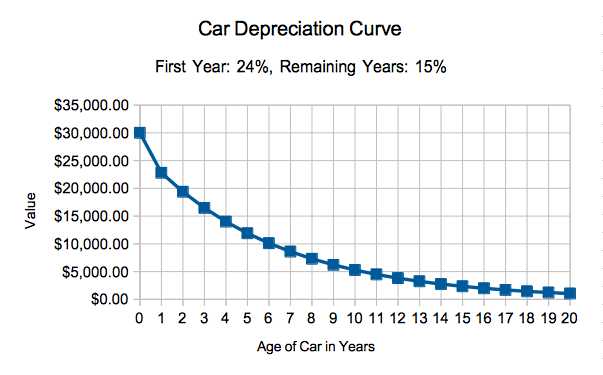 And here is a car depreciation curve showing how the value of the vehicle continues to decline over time. Of course, the above is only an estimate as the actual depreciation varies depending on which vehicle you buy, how many miles per year you drive the vehicle, and how well you take care of the vehicle. As reported by the AAA, the average annual cost of owning and driving a vehicle in 2018 was $8,849 -- 40% of which ($3,540) they attributed to depreciation. And since the study was based on 15,000 miles driven per year, this would put the average depreciation cost per mile at $0.24 ($3,560 / 15,000). Here is a little calculator I put together to help you estimate your depreciation cost per mile based on the AAA's driving costs findings. Here again the actual cost of depreciation will depend on many dependent factors. This method simply subtracts the expected salvage value from the purchase price of the vehicle. Since there are numerous unknown variables that come into play when estimating the cost of depreciation, the only time you will be able to determine the exact size of the expense, is when you actually sell, trade, or scrap your vehicle. Only then will you know for sure just how much your automobile dropped in value since you purchased it. As to what variables are "unknown," they would include variables such as the economy, the price of gasoline, the number of miles you drive your car, the condition of the car, and the demand for the particular make and model of the car. Considering all of these unknowns, the goal of the car depreciation calculator is not to calculate the exact amount by which a car will drop in value. Instead, the goal of the calculator is to provide you with a means to compare depreciation costs for various car buying scenarios, and to show you how these costs, plus the forfeited potential future wealth, can add up over the course of your lifetime. Earlier I said that when you trade cash for an automobile it's presumed that the value of the automobile is equal to the value of the cash that was traded for it. In reality there is only one buying scenario where that presumption would be somewhat correct -- a scenario wherein you purchase the car from an individual. If you purchase a used car from a car dealer, the value of the automobile will instantly drop in value the moment you drive the car off the lot. That's because the auto dealer marked up the value of the used car to include a profit margin. If you want to know just how much that drop is, immediately drive your just-purchased car to a competing dealer and ask how much cash they'd be willing to give you for the car. But wait, that drop in value is nothing compared to the drop in value you will experience if you purchase a "new" car. When you purchase a "new" car, the "new" car instantaneously becomes a "used" car! So not only will the new car's value drop by the amount of the dealer's profit margin, but it will also plummet by the drop in the perceived value ("used" is far less appealing than "new"). All together, this warp-speed depreciation that occurs the moment you drive a "new" car off the lot can run in the 10-30% range. Ouch! Now if you add to that the fact that cars depreciate faster in their early years and slower in later years, buying a "new" car every 1-3 years will cost you a fortune in hyper, warp-speed depreciation and foregone interest earnings (test these types of scenarios in the future car value calculator on this page and you will see what I mean). I personally know middle-income individuals who buy new, $30,000-$50,000 vehicles every 1-2 years. I could literally retire on what they are throwing away in depreciation and forgone interest income. Most financial "experts" will tell you that the key to getting the most value out of your exchange of cash for an automobile, is to purchase an automobile that has a low (slow) rate of depreciation (a.k.a., high resale value). What's wrong with that advice? Well, considering that the cars that have the lowest depreciation rates also tend to have the highest sticker prices, any depreciation costs you save may be largely offset by the increased price of the car and higher insurance premiums. If you really want to lower the depreciation cost of owning a vehicle, the key is to either buy a new car and hold on to it for a long period of time (say 8-10 years), or to buy a slightly used car often enough to avoid the costly ongoing repairs that can come with heavily used vehicles. Of course, if you can walk or ride a bike to work, and/or you have access to public transportation, you can eliminate car depreciation costs all together.